Inspiration can really come from everywhere; in the bus, in the bath, in front of the tv or computer. The idea for this particular pie I had when I joined a Facebook group about food allergies. So much interesting things to learn! I immediately ran out in the kitchen with pen and paper, the usual start for my recipes and started quickly gathering all the ingredients. Ready, set and go! It took a few times before I got it the way I wanted it. Now it’s ready. A pie made with chickpeas (do you also have the freezer full of them after making lovely aquafaba mayonnaise …?). 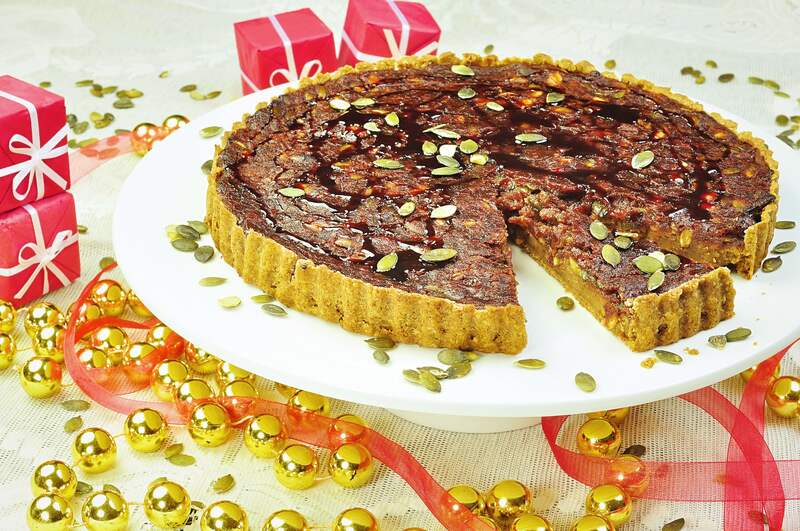 A rich filling made with sweet potato and chickpea flour instead of eggs and a topping with a toffee-like cream. The Christmas taste comes from gingerbread-spices that I have been using, a mix of cinnamon, clove, bitter orange, cardamom and a tiny bit of pimento. Use pumpkin spice to replace the seasoning. Serve the pie in thin slices with a bit of whipped cream or vanilla ice. Don’t worry about the list of ingredients, it is a bit longer and contains perhaps a few more steps than usual but nothing is difficult in the recipe. To make the recipe you need a hand blender or food processor at hand. The pie crust is delightfully crisp and if you exclude the vanilla powder it surely can be used pot pie. The same applies to the filling. Enough talking, let’s get to work! 1. Mix all ingredients in a food processor or with a hand blender until you have a nice, smooth and fairly firm dough. 3. Flat out the dough with your hands in the pie dish. When finished, dot the surface with a fork. By doing this the dough will not glide down during the baking. 4. Bake the pie shell about 15 minutes and let it cool off slightly before adding the filling and once more bake it in the oven. 1. Lower the heat on the oven to 150 ° C.
2. Peel the sweet potato and cut into smaller pieces. Add it to a smaller pan and cover with water. Let it cook until the potatoes are soft. 3. Whisk / hand blend the chickpea flour and water in a mixing bowl. Leave it to soak until the potatoes are fully cooked then pour off the water. 4. Add the boiled sweet potato and other ingredients to the chickpea mix. Blend and mix until you have a smooth “custard”. 5. Pour the filling into the somewhat cooled pie crust and bake it 45 minutes at 150 ° C, or until the filling has set. Preferably allow the pie to rest for 15-20 minutes before pouring over the soft caramel cream. 1. Raise the oven temperature to 225 ° C.
2. Toast the pumpkin seeds until golden in a dry skillet. When they smell nice, pour into a separate bowl and set aside. 2. Melt the coconut oil in small saucepan and add the remaining ingredients except the pumpkin seeds. Allow the mixture to gently simmer for about five minutes or until thickened. Add the pumpkin seeds and carefully fold them in without breaking. 3. Divide the caramel cream over the finished pie and bake the pie for another 15 minutes. Allow the pie to cool off slightly before you tuck into it. Keep the pie in room temperature, if not it will become soft. It stays fresh for 4-5 days. This recipe is gluten-free (if you made your own oat cream and oat flour on gluten-free rolled oats as in this recipe), lactose, milk protein, eggs, nuts, soy and refined sugar. Sorry, this is taken care of my website developer and I’m unable to give any advice concerning this. Hope you find another person that can help you further.